So did you have some fun on Mardis Gras and get all of your naughty behavior out of your system before hunkering down for the lenten season? Yeah, me neither. 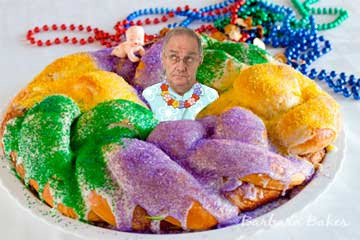 I totally did the Fat Tuesday part, but not so much on the lenten hunkering down. The way I see it, I'm not even two months into breaking my New Year's resolutions - not to mention my Chinese new Year's resolutions - and adding more bricks onto the load is just setting myself up for failure. But I did pick up one new obligation out of this carnival season, which I will absolutely honor. I was the recipient of the baby trinket in my piece of king cake, making me king for a day and putting me on the hook for making next year's king cake. You have no idea what I am talking about, do you? That's okay, neither do I most of the time. But when it comes to cake, as you may well know, I am totally locked in. The king cake is a traditional sweet in the Christian tradition, and is typically associated with the three kings' visit to the baby Jesus on the twelfth night after his birth - also known as the Epiphany. However, as immigrants from Spain and France brought Catholic traditions with them to the New World, the cake began making appearances in the pre-lenten festivals of Carnival and Mardis Gras. The composition of the cake varies, but it is usually a ring or a braid, similar to a cinnamon roll. The king cakes of the Gulf Coast are typically covered in a sugary icing in the yellow, green and purple colors of Mardis Gras, and have a hidden trinket inside or underneath them. Sometimes the trinket is just a bead, like those thrown from the parade floats, but more often than not, it is a small figurine of a baby. The person who gets the piece with the trinket is the king (or queen) for the day, and now has to provide the cake for the following year's celebration. Some regional variants suggest that the recipient is going to have a baby in the next year. So unless you know something I don't, it looks like I have 364 days to figure out how to make one of these things. Of course I could just buy the thing online and have it delivered. Looks like I can get one for about $50 (including the baby) from Cannatas or Dianne's King Cakes. They both get great reviews and appear to be just like what I had at the king cake party. But it feels like cheating to me. Of course I travel for a living, and baking a cake on the road can be challenge. Not to mention that I cannot bake. But, I've got nearly a year to figure this all out, and I have to imagine that not fulfilling my obligation will be accompanied by some sort of voodoo hex. Just what I need. I suppose if I want it to be super-authentic (and fresh), I could get a timeshare rental in New Orleans the week of Mardi Gras 2013. The Maison Orleans/Hotel de L'eau Vive has full-size kitchens and is within steps of the French Quarter, where I could score my ingredients. I don't see anything posted on RedWeek yet, but I'll sign up for a posting alert and keep it in the old tickler file. Hotel de L'eau Vive, by the way, translates into Hotel of the Living Waters in English, which I suppose is some sort of reference to indoor plumbing. But don't quote me on that one. Ooh, I know. I can get one of the many New Orleans celebrity chefs to help me. I am sure John Besh, Emeril Lagasse, Paul Prudhomme, or Leah Chase have nothing better to do than to teach a rank amateur how to knock out a king cake. Hey have you ever noticed that you never see Dom DeLuise and Paul Prudhomme together? Okay, I know DeLuise died in 2009 and it is time for me to hang up that joke, but they really did look exactly like. I guess a cookbook and some trial and error are in my future. This much I do know: my king cake is NOT going to have a baby in it. No sir. I am going with the Timeshare Ambassador action figure instead. That's right, ThatsMyFace.com will take a photo of my face and put it onto a 3D head that fits any 1/6th size action figure body. Now I just need to find a 1/6th action figure body of a portly older(ish) man in a Hawaiian shirt.